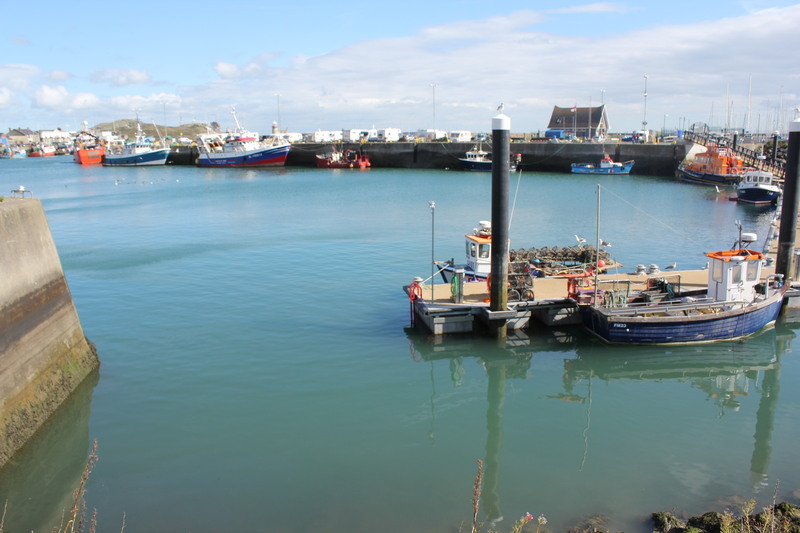 We must have the luck of the Irish with us as we leave Dublin to go to the seaside town of Howth only to find our accommodation is not booked – so much for relaxing! We meet John at the last stop on the Dart (a train that connects the coastal villages) who offers to help us and it’s one of those things where you think, ok but this is going to cost me. He leads us to an information booth and they have a phone around the local pubs. John knows someone, actually I think he knows everyone, and has us tentatively booked in. John leads a walking tour around the cliffs and as we cannot officially book in until 2pm we decide to take the tour. It is a lovely day for walking, the scenery is superb and John keeps us very entertained with tales of woe, a fight with a devil, love stories, history lessons and we get to see the best viewing spots. On the way back to town he even drops into the pub where we are staying and introduces us. The cost of the walk is up to you which is difficult as being Aussies you really like things up front and even more so when he has helped us so much. I absolutely recommend the walking tour as I’m sure you miss a great deal just wandering around yourself but no matter what the views are breathtaking. Howth is quite hilly so we lug our bags back up the hill to McNeills of Howth and are warmly welcomed. Our afternoon consists of checking out the pier, the really nice looking crayfish – Shane is drooling as they are the equivalent of $38 a kilo (but we only have a kettle to cook them in so no go) and we end up with fish and chips on the pier. We decide to have a quick couple of pints and find we are in for quite a night with mainly locals at the bar we get involved in some very lively conversations, lots of laughter and some more great stories. It turns out Howth has some spooky facts about people from here if they go missing in the sea they are never found, no bodies are ever retrieved. There is a story of two little girls one from Howth and one from away, both whom sadly drowned but only the girl from away was ever found. We are about to head upstairs to bed when dad is introduced to Larry the lobster who is tucked away in a foam box sitting below the bar – yes still alive – ready to be cooked up but the bloke though he might drop in for a pint or 10 – 8 hours later he and the doomed lobster are on their way. It’s hard to explain what a great night, or early morning 2:30am, we had as even the publican comes in to shout these Aussies a drink – it makes me wonder why we booked the room as we hardly got to sleep in it. The next morning, a little worse for wear, we head off to finish the cliff walk, through small wooded areas to open areas high above the coast that are covered in flowers, various purple heathers, yellow gorse and in some sections beautiful fuscias in bloom. 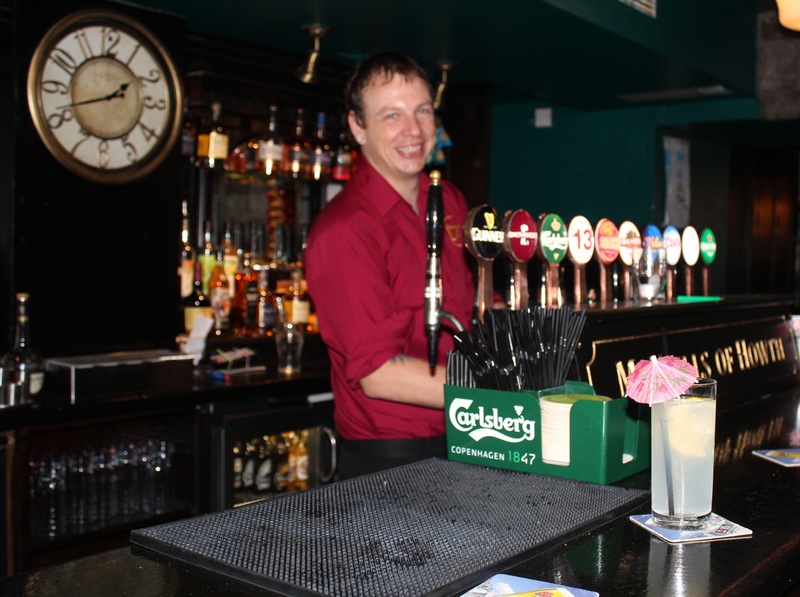 We leave the pub with one last Guinness and when Shane asks for a lemon squash Kevin, the bar man, obliges in typical fashion – umbrella and all! Ireland has been a real gem, the scenery is outstanding but the people have made it for us and our final bus out to the airport is no exception – we have the wrong card but the driver tells us to hop on and he will see us right. It’s a long scenic bus trip along the coast, a real bonus and thankfully we had plenty of time to get to our flight as I think it took well over an hour. 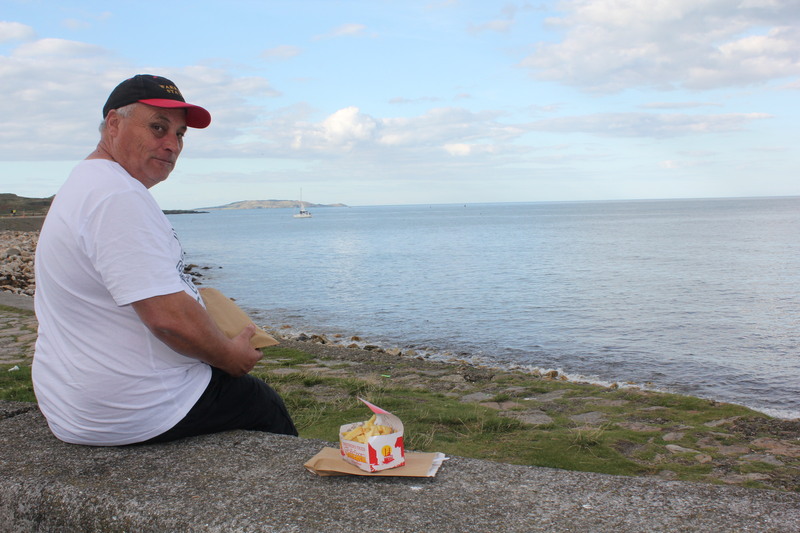 We shall remember this trip for a very long time and will always smile when we think of Howth. This entry was posted in Travelling on August 30, 2016 by peakesj6. On the bus again nice and early but all is well – the is sun shining with beautiful Irish countryside to view on the way. Our tour guide is quite a character and we are all ‘my lovelies’ – even getting us to sing ‘you are my sunshine’ to ensure good weather. We enjoy more of stories of the dramatic history of Ireland and also interesting folklore. My favourite being the 3 million dollar fairy tree. When building the main highway from Limerick to Galway a fairy tree was discovered and after several meetings it was decided to divert the road around it costing in the vicinity of 3mill – all to avoid bad luck. The story goes that this tree is the meeting point for the faeries of Munster (southern region of Ireland) when they go into battle with the faeries of Connaught (western region of Ireland). 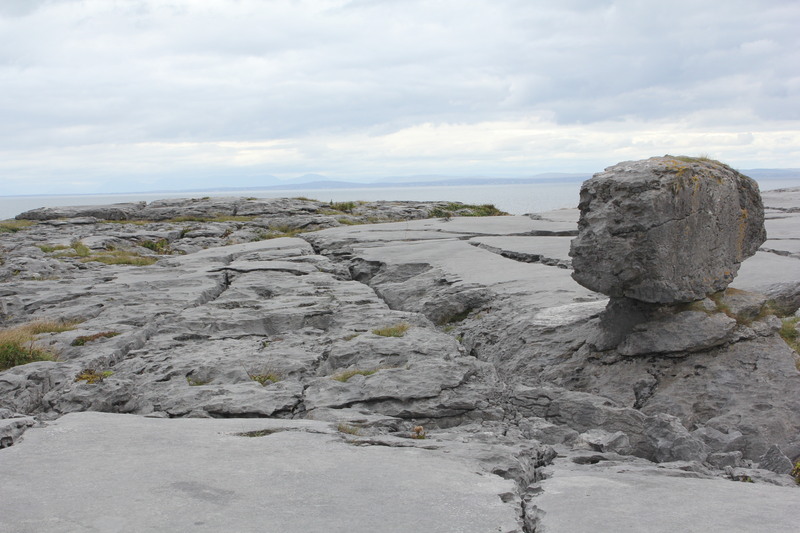 The Cliffs of Moher also have many myths and legends surrounding them, witches, hags, horses and eels. They truly are an amazing sight and have seen many movies scenes filmed in the area – Princess Bride and Harry Potter as an example. You are completely in awe of what Mother Nature can produce. Rising over 200 metres above the Atlantic Ocean we make our way along the cliff path. Passing quaint thatched roof houses, leprechaun war horses (Shetland ponies) all beside the wild Atlantic sea we make our way to the area called the Burren. A stark stoney area caused by lava mixing with ice that makes you feel you are on a strange lunar landscape. Galway is a place I would have loved to spend more time at great seafood – say no more. Of course there is a lot more a facinating history with this being one of the busiest most important ports of a long time passed. The tragic story of the Lynch family ending with the father hanging his one and only son and apparently where the term ‘lynch mob’ came from. When two people got married half of the family crest was used for a new crest signifying the new family. We chose to go with Wild Rover tours, mainly because they packed quite a lot into a day – of course that does mean we have to get up for an early start. On the way we hear how history formed the people of Ireland, the invasions, the changes to the landscape and languages all nicely peppered with humour and quirky tales. The weather is perfect with the promise of spectacular views. In Belfast we join the Black Cab tours for a trip we will never forget. You get the feeling that at any moment hostilities could again erupt and end the intangible peace. Our guides are factually abrupt and tell stories of people caught up in the ‘troubles’ and explain the murals that are dramatic and powerful artworks. We are shocked that the ‘peace’ wall gates are shut each evening and that there are still marches that cause great divides amongst the locals. Each guide has his own story to tell, ours, lost his father when he was 7, was imprisoned went through believing his life would end violently and there was so much more. Very thought provoking, very emotional and it’s hard for me to wrap my head around the whole situation – Shane was thoroughly mesmerised. Probably my favourite as has covered a more violet mural of the past with a hope for the future. 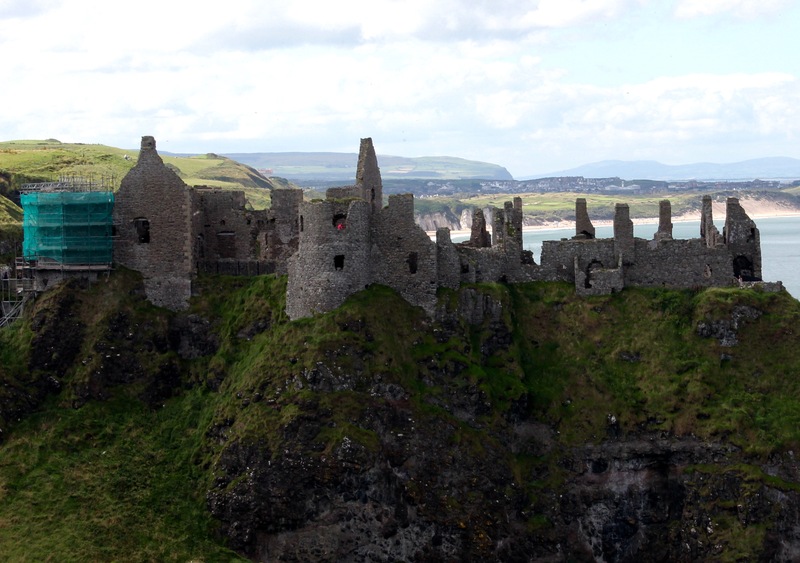 On the way to the Giant’s Causeway we see the medieval Dunluce castle the location used in the Game of Thrones for the House of Greyjoy. Now for stories of angry Giants one called Finn McCool and building of a pathway from Ireland to Scotland a much better explanation than 100,000 millions of years of lava heating and cooling. The large almost perfectly formed hexagon shapes in black basalt stone, stacked one on top of the other is really something special. Next stop is to brave the Carrick A Rede Rope Bridge, not for the feint hearted and when I see how the fisherman did it back in the day……..it’s insane! The walk and views along the coastline are spectacular and on this very clear day we can see the land of Scotland – apparently a very special day. This entry was posted in Travelling on August 27, 2016 by peakesj6. Sooo we get up early and make our way out to Stansted Airport, struggle through the necessary security, searches and scrutiny, hurry through to our gate with 15 minutes to spare only to find it has been delayed by 3 hours – 1pm in the afternoon. Ryanair is, of course, very generous with a £3.50 refreshment voucher each which is flat out buying a coffee. It also means that we won’t have much opportunity to see much around Dublin so we already contemplate another night in Dublin. The friendless of the Irish starts right at the airport and we are advised to go to O’Neills for a top meal at reasonable prices plus they know how to pour a good Guinness. 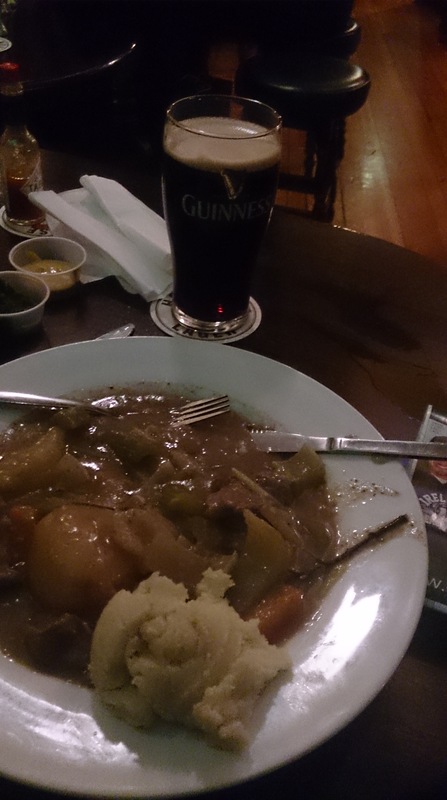 We both have the Irish Stew and it is delicious, almost as good as my mum used to make. 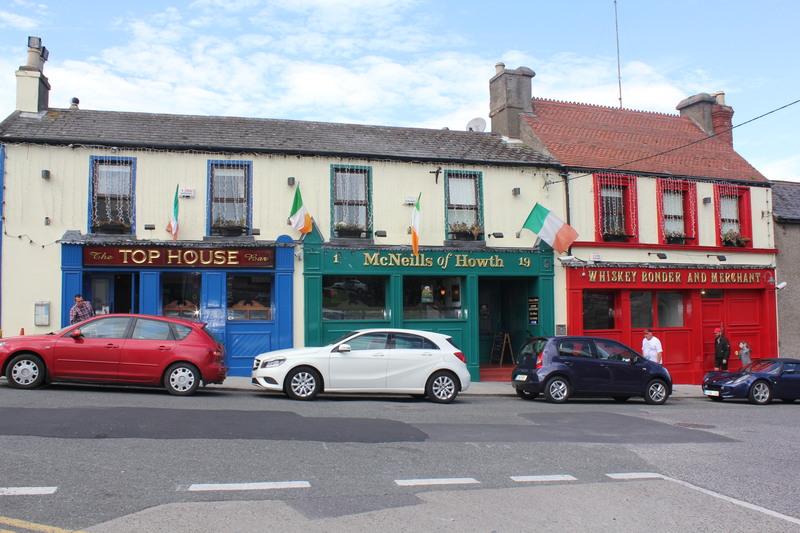 I also have to agree with what most people seem to find out in Ireland – Guinness tastes amazing here – although after the day we have had it could just be I’m extra thirsty. This entry was posted in Uncategorized on August 26, 2016 by peakesj6. Despite the consistent heavy rain as we leave London most of us, 3 out of 4 in the car, are optimistic about the weather fining up at Whitstable. The city houses disappear and are replaced by fields, farms and country houses – so much space. The sun is out when we reach our destination but it is windy, ‘would blow a dog right off its chain’ – which is appropriate because there are dogs on chains everywhere. Whitstable is such a colourful place – boats bobbing in the harbour, inviting old fishing shacks turned into accommodation and even a group of acapella singers. A market offers up some very clever crafts, artwork, food and I go away with lots of ideas for projects – That will probably never see the light of day. Time for oysters and we all decide on Skate and chips. The fish is a bit of a challenge with long soft bones but Jasmine masters the technique of scrapping the meat off and we all enjoy the flavour. (Back home I searched Skate and found it to be similar to a stingray so I probably wouldn’t have even tried it!) The oysters where shucked fresh, juicy and delicious! On to Canterbury only 8 miles away. Daniel previously worked here so he knows his way around. Through some lovely gardens along the river. We meander around the streets and then I am encouraged to look through the cathedral – I have vague memories of visiting this place with my mum, dad and sister when I was – my mum was a bit worried as she had her hair in rollers. The Cathedral is incredibly special and so much to see. Some of the tourists still like to hop over ropes and one of the brothers fully decked in long black robes was getting most insistent that they “turn back immediately”. The price of having to earn a buck from the public to maintain the buildings. This entry was posted in Travelling on August 21, 2016 by peakesj6. Time for Shane and I to test out our getting around London skills. At Green Park we are trying to find Snaps gallery to check out some unseen photos of Bowie and we discover that a map would be a useful thing to have. I casually go into a hotel and proceed to be treated as a guest with the full concierge treatment – map in hand with instructions and printouts we find our way successfully. The gallery is very unique with photos of Blondie, Bowie and the Rolling Stones – a bit on the expensive side with prints going for around £1,000. Our next task was to get tickets to a palace tour today from an information centre but the guy sort of sneers at us and scoffs “no tickets until next week”. Deciding to go for a look anyway we easily get tickets at Buckingham palace and I’m quite ‘chuffed’ to be able to set foot inside one the Queen’s humble abode – even Charlie welcomes us to the palace albeit via a video. It’s a couple of hours before we emerge out into the spectacular gardens. Well worth the look, I especially enjoyed the fancy frock display that started when she was babtised through to now – seeing the intricate, detailed work up close is really impressive. There is so much more of course from climbing the main stairs, huge halls adorned with artworks that I have no real words to describe, every nook and cranny has beautiful decor, the chandeliers dazzle and glitter and even a secret passage revealed. The tour finishes with a lovely stroll through Lizzies vast backyard – truly a memorable experience. Jamacan deliciousness for dinner and then it’s off to the Hootananny’s for beers, music and to watch the Brits win gold in the hockey. This entry was posted in Uncategorized on August 21, 2016 by peakesj6. Daniel,s answer to jet lag is to stay awake, so we will be keeping busy today to distract us from collapsing – I will let you know how that turns out. The weather is doing its best for us too, warm and sunny. 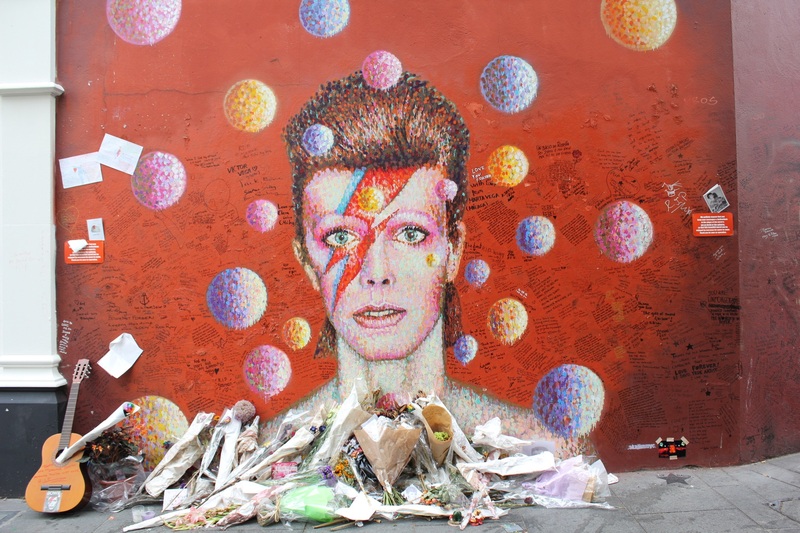 A walking tour of Brixton through the pop up restaurants, equally colourful clothes and people, butchers and seafood shops one after the other and music overlaying each scene complimenting the already lively atmosphere. 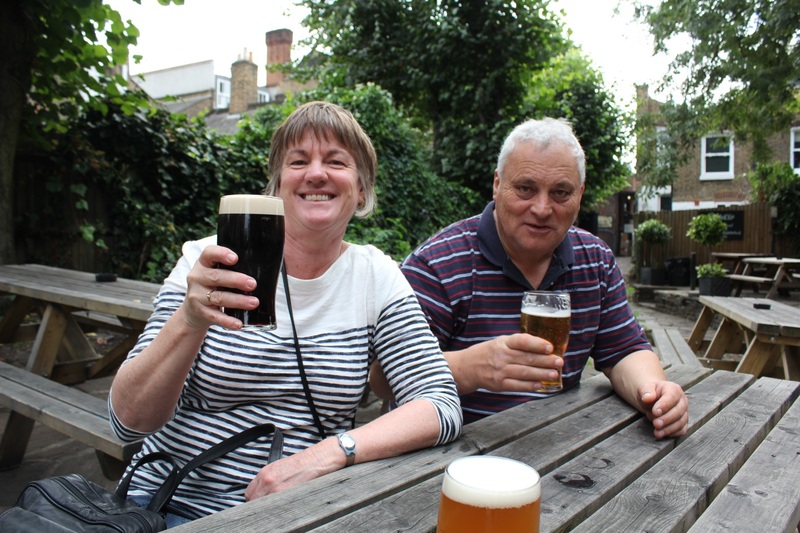 We then head for some familiar territory revisiting Camden and even enjoy a beer at the same place – must be our local ha ha. After our vey enjoyable refreshment we walk along the canal getting a small glimpse of life on the water in narrow boats. Through to Regents Park and again I am impressed with how vast and fantastic these public parks are. 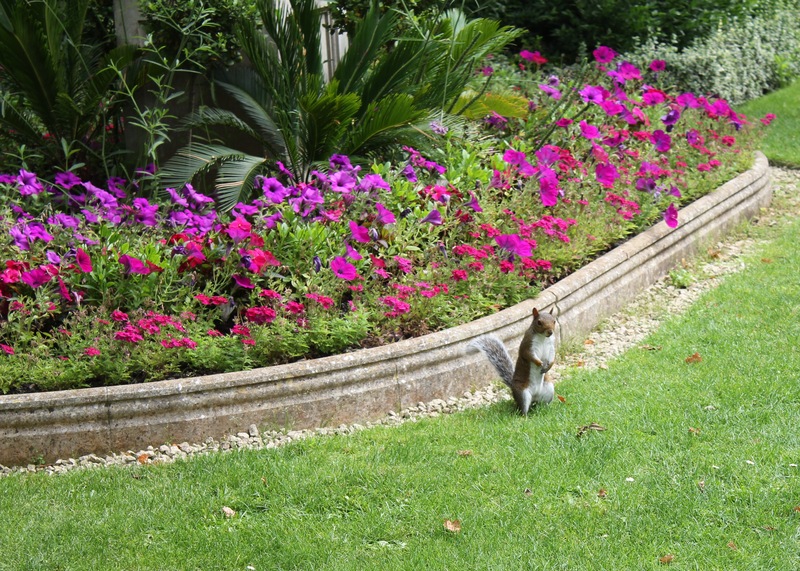 I can’t resist the cheeky cuteness of the little squirrels even if they are pesky pests. Although the gardens are at the end of their best the walk is lovely and my bottom certainly appreciates the non-sitting component. Back to Brixton and a nice stout hits the spot before Dan’s amazing pulled pork wraps for dinner. It isn’t long before Shane is falling asleep on the lounge and after some convincing I do manage to get him into the bedroom only to find him later still fully clothed, shoes on asleep across the bed. Some more sterner encouragement and he is finally in bed and I too will not be far from joining him. This entry was posted in Travelling and tagged Brixton, Camden on August 20, 2016 by peakesj6.